The cover for my (oh so very nearly ready for release) EP, Into the Blue was painted by Caroline Campbell. I’m an enormous fan of Caroline’s work and I was so honoured when she said she’d be up for collaborating. 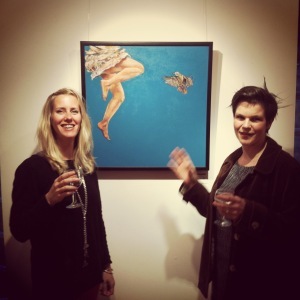 Here is a cheesy pic of us with the painting at Caroline’s recent exhibition. The painting got snapped up moments later…some lucky so and so will have it on their wall soon.